We still have another week until the Pro Tour, but after the first week of standard at the SCG Open as well as at thousands of FNM’s around the world, the new “players” in standard are starting to show their faces. A simple click of SCG Open’s Top 8 deck lists will show you that Smuggler’s Copter is the #1 card from Kaladesh as it was played in a lot of the decks, but what about the other cards? Which cards will lead to deck innovation and which will breathe new life into previous dormant strategies? I’d like to take a quick look at the cards that showed up in the first week in standard and talk about their potential impact in this season’s standard. With most of our ramp cards gone from standard now, Aetherworks Marvel is the next best thing for getting out our massive finishers like Emrakul or Ulamog. The deck showed up at the SCG Open, but it didn’t finish that well, putting only a few variations in the top 64. Does that mean that the strategy isn’t viable? I’d say anything but. This strategy is still in its infant stages and it will be tweaked and come back better than ever. Green, blue, and red will be the best colors to use since they give you the best energy bonuses, but I think the card goes well in Emerge decks too. The current “Eldrazi only” decks have problems against fast decks since it usually takes 4 turns to get going, so I could see this deck adding in creatures instead of puzzleknots to buy time until you can cast your finisher. Adding in the Emerge factor adds energy when you sacrifice a creature, plus it allows you to play more big finishers like Elder Deep-Fiend. I expect it to be a Tier 1.5 deck this winter. GW Aggro had a few more players in the event than Aetherworks did and they performed much better. Tom Ross actually managed to make the top 10 with the deck. It can crush slow decks or decks with a poor removal packages simply by overpowering them, and it can finish a game 2-3 turns after playing Verdurous Gearhulk. The deck has some problems with consistency I think, and it can struggle those games where you don’t draw the Gearhulk and play it on curve. 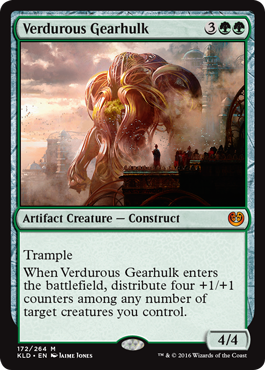 Once the meta settles down I think GW aggro players will be able to choose the best combination of green and white creatures and really take advantage of the Gearhulk. Tier 1.5, possibly Tier 1 in the future. 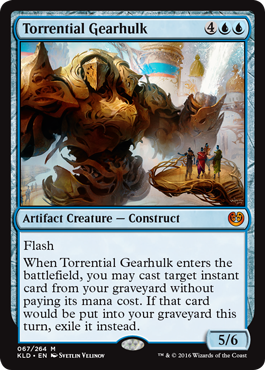 I didn’t see too many Torrential Gearhulk at the Open, but you can’t deny that it’s powerful. The only top 64 deck I saw with it was UW Control, and that deck didn’t really abuse its power at all. It’s true power lies in UB control, or better yet Grixis. Instant speed removal spells such as Fiery Temper, Murder, and Unsubtantiate have become incredibly powerful and the Gearhulk can take advantage of their full potential this standard season. A UB Gearhulk/Metallurgic Summonings deck went 5-0 at a tournament here in Nagoya last weekend playing a playset of Gearhulks and jamming the list full of instant speed spells. He was able to take over games by killing opponent’s creatures and countering their spells while putting in construct after construct X/X token creatures. Without any creatures on the board, he could easily swing in with all of his token creatures and win the game. Torrential Gearhulk made the deck that much stronger by letting you playing your instants again and creating huge tempo swings. Not to mention it’s a great finisher in and of itself. I expect UB or Grixis to be Tier 1.5 decks in the coming weeks. Smuggler’s Copter might have been the winner from week 1, but Fleetwheel Cruiser is lurking in the background, waiting for its time to shine. 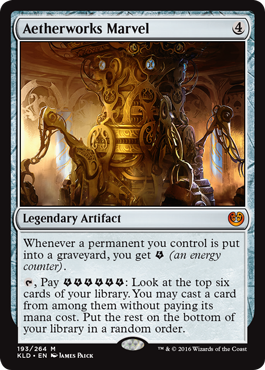 Sure, it’s good in those RW Vehicle and other RW aggro decks, but I think it has a lot of potential to be a breakout card in GR Energy/Vehicle decks as well. I played against some people who were going to RPTQs and the next Pro Tour and go to see how powerful it could be. Alongside Smuggler’s Copter, Voltaic Brawler, and Lathnu Hellion it can finish an opponent incredibly quickly. 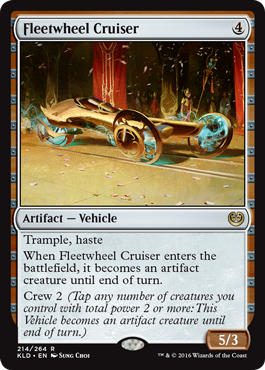 I expect GR aggro to get big after the Pro Tour, and Fleetwheel Cruiser to show up a lot more. It also has good synergy in BR aggro decks alongside Unlicensed Disintegration (which 4th place Jacob Hagen probably knows all too well). 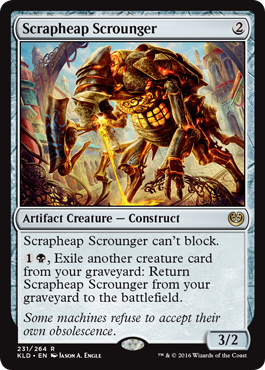 Scrapheap Scrounger showed up quite a bit in week one as well. Not only is it a good aggro card, but it also works great in Emerge and Delirium decks. I expect that any black based aggro deck will be playing 4 of these, and while it won’t be a format staple I’m sure it will be a good card to have in the coming weeks. Both the 2nd place (Grixis Emerge) and 4th place (BR Aggro) decks played it as a 4 of. Just some food for thought. Having artifact removal is definitely going to be important this standard season, and being able to exile them even more so. There are also some standard cards that I believe will get better in this format but I’m going to wait until after this weekend’s tournament to talk about those (look for my picks in my Bang For Your Buck investment articles next week before the Pro Tour). Without Dragons of Tarkir and Magic Origins in standard any more, I had to take a hard look at my decks and decide which strategies would be the best to pursue. I had really enjoyed my RW tokens deck and didn’t want to see it disappear. Having Secure the Wastes rotate was a big shock though, so I need to be creative and put together a new, modernized version that had similar cards but also was able to operate in pretty much the same way. What I came up with was this. 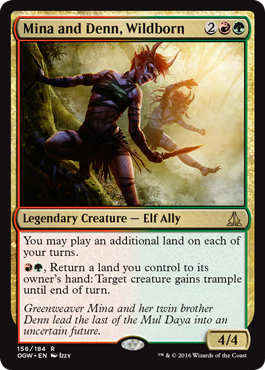 There are a lot of familar faces in the deck (Gideon, Hanweir Militia Captain, Reckless Bushwhacker), but there also quite a few “upgrades”. The first change I did was add in Inspiring Vantage to fill the void left by Battlefield Forge. While I like that I don’t have to lose life to my mana anymore, I do miss not having to worry about my land coming in tapped or not. I don’t think it will be that big of an issue, but at least I know that my mana base is relatively intact. 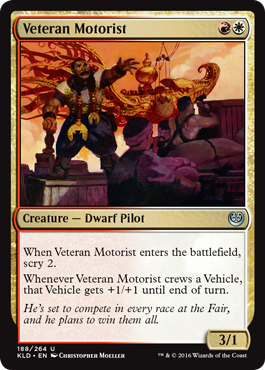 My next big move was to drop Thraben Inspector for Veteran Motorist. While it’s good to have a one drop to start off the game with, the power level and ability of Motorist is just too strong not to play. This deck is a midrange deck that can mimic an aggro one, so it’s important to set up your draws so that you get the mana you need or support card that will blow the game wide open (like a Goblin or Gideon). Another reason for playing him is that he trades very well with other aggro decks. Inspector was a roadblock, but Motorist is tire spikes. The creature count is slightly higher in this version than last season thanks to Angel of Invention. It’s not strong against removal, but it does a great job of acting like Gideon emblem #5 and #6 while it’s in play. 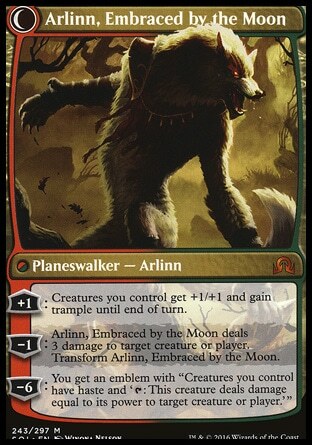 It also offers you some main deck lifelink which can mess with aggro decks that have already used up their removal. If you draw it late game the extra tokens can also be quite useful, buying you the time you need to fly over an opponent’s head and stabilize. At first, I wasn’t convinced that I needed to play Smuggler’s Copter but my cardboard Samurai friends talked me into using them and now I can’t imagine a build without it. Tokens make it easy to crew (thanks to Servo Exhibition which took over for Dragon Fodder), but what I like most about the card is that it’s so hard to kill without instant speed removal, and is made stronger by cards like Veteran Motorist. The removal package also changed with this new build. Gone to the sideboard are my Declaration in Stones and Collective Defiance, and in their place I have a removal suite of Incendiary Flow, Stasis Snare, and Collective Effort. The change to Flows was mostly because tokens are no longer a deck to worry about, and decks that use a lot of the same low cost creatures aren’t as popular as they once were. I also didn’t want to give my opponent card advantage. I still wanted an exiling effect though, which is why I moved Stasis Snare to the mainboard. If you can’t get rid of an Emrakul at the end of your opponent’s 4th turn, you’re in trouble. This is also part of the reason behind having a Collective Effort in the main because it can also kill a big creature like Emrakul, but also because the counters on all of your tokens can also be very powerful when played in conjunction. Authority of the Consuls was surprisingly good against aggro decks the first weekend here in Nagoya. Not only did the life gain let you stay ahead until you could stabilize the board, but it also tapped in all of their creatures so it became incredibly hard to crew their Fleetwheel Cruisers or Smuggler’s Copters. I would highly recommend it if you’re having problems against aggro decks. 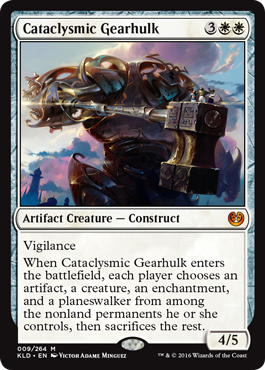 Another card I was incredibly satisfied with was Cataclysmic Gearhulk. It did a lot of work against RW aggro decks and cleared the board for me against some midrange decks. Being able to tutor it with Nahiri was pretty sweet, but leaving it in play alongside a Gideon and Hanweir Garrison was crushing against some of my opponents. 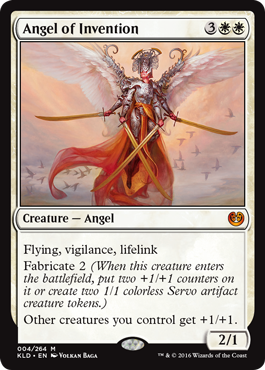 Now that Languish is out of the picture, it seemed like a good time to bring in Archangel Avacyn. I expect a lot of people to play Fumigate or Planar Outburst so having a way to save all your creatures from destruction will be pretty important. The initial results of this build have shown some promise. I went 3-1 for 2nd place at a 14 person tournament on October 1st, beating GW Hulk Aggro, 5 Color Superfriends, and Grixis Emerge but losing to a Jund Delirium deck. The removal worked really well in these games, and Smuggler’s Copter + Gideon was killer against the control deck. Hanweir Garrison also did a lot of work in my wins when left alone. I managed to Meld it twice for wins. Against the Jund deck, I wasn’t aggressive enough and allowed him too much time to set up his board for Emrakul. It also didn’t help that I got mana screwed in the following game and got stuck with 3 Gideons in my hand. On October 2nd I went 3-2 at a 24 person event for 9th place. I lost to Esper control in round 1 because I didn’t attack fast enough. My opponent had counters and kill spells for everything, and the best way to get around this would have been to keep fast hands and to go wide. I bounced back in rounds 2 and 3 by beating GW Midrange and RW aggro. The GW deck used Giselas and flyers instead of using Gearhulk, while the RW aggro deck was very similar to the Vehicle decks except that it flooded the board with Toolcraft Exemplars and Inventor’s Apprentice and attacked incredibly fast. The only thing that saved me in this round was a well timed Cataclysmic Gearhulk and a few Authority of the Consuls. I had a close match against RW Vehicles in round 4, but a point of miscalculation in game one and poor sideboarding in game 3 screwed me up. I’m sure my deck can beat it more consistently with proper practice. In round 5 I beat a BR Vampire deck thanks to Angel of Invention in game 1 then my opponent mulliganed to 4 and conceded in game 2. Lucky. It seems like most people are jumping on the RW train for the first few weeks, and not far behind are GW Hulk decks. There were a few Aetherwork Marvel decks as well, but I think most people are sticking with what they know. I expect GB Delirium decks to show up in force in the coming weeks, as well as the Emerge decks (at least until after the Pro Tour). Speaking of Delirium decks, I have one of my own I’ve been working on. I had originally tried to build a GR elemental deck based around filling the graveyard with lands and then using Splendid Reclamation to bring them all back at once for multiple landfall triggers, but instead I opted to go the delirium route. I would say that it’s more of a mix between ramp and delirium though. Sylvan Advocate and Tireless Tracker could be found in just about any green deck, but I added in a couple more that haven’t shown up in standard yet. I had them in, I dropped them, and now I have them back in. Mina and Denn are an interesting couple to say the least, and they have a few roles in this deck. First and foremost they’re ramp. If you’re getting lands back in your hand with Grapple with the Past or tutoring them with Traverse the Ulvenwald, they help you play it a turn faster. This is important if you’re trying to cast a 6 mana card on turn 4. 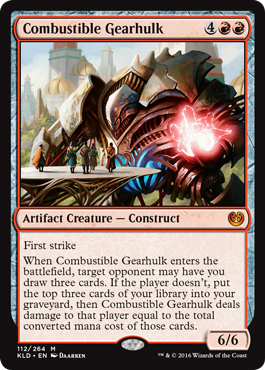 One of the reasons to get to 6 quick is Combustible Gearhulk. This card is an automatic 3 cards when you cast it. If your opponent is crazy enough to roll the dice, they could be in for a very unpleasant surprise. If you were to put an Emrakul and Omnath into the graveyard off of this ability, it would be game over for your opponent. 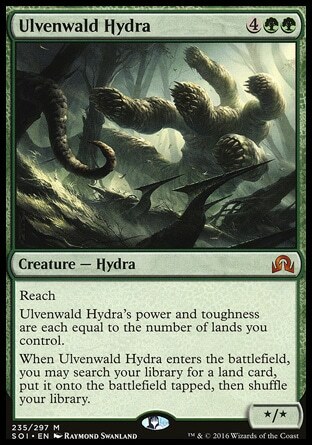 They card that I really like in this deck though is Ulvenwald Hydra. It comes into play huge and lets you tutor for a land to make it even bigger. My current land of choice is Hanweir Battlements because whichever card I draw afterwards can get haste and finish off my opponent. This is a good card to have alongside Mina and Denn as well since your opponent will have a hard time chump blocking it if you’re always giving it trample. It’s a good stop gap against Smuggler’s Copter, Avacyn, and Giesela. The Hydra will shut down your opponent cold. As for the other cards Emrakul is a given, seeing as though you can search it up with Traverse the Ulvenwald and the pseudo-Delirium deck can let you cast the Eldrazi for 9 mana. I also thought that Omnath should have a shot at some standard as well because of how game ending he can be if left alone (especially with Mina and Denn). One of the reasons he was left out of past standards was become of all of the instant speed removal spells, but now that he has a chance to affect the board, and can be brought back with Grapple With the Past, I expect him to do some real damage. And the final card I added in was Ulrich of the Krallenhorde because I thought the deck needed something that would give it a little more speed and power. Making a Mina and Denn an 8/8 on turn 4 is sure to cause some problems for some players. 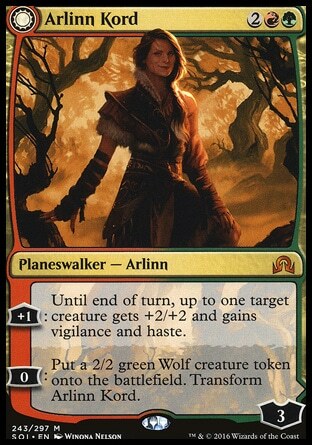 The card that has surprised me the most in this deck has been Arlinn Kord. Of course it’s fun to give your fatties haste when they come into play, but she can be really dangerous if well protected. I found her +1 ability to be a great asset to the deck and being able to flip and give your creatures trample on a stalled board was also useful. If this deck is good at anything, it’s good at gumming up the ground and if your opponent doesn’t have a lot of flyers Arlinn becomes quite the threat. I’ve yet to ultimate her in testing, but I’ve come really close. I usually find myself way ahead in the game if she gets to that point. I wouldn’t be surprised to see her show up a lot more in future GR decks. As for the sideboard, I have cards that I think will work well but are largely untested. Arborback Stomper is a card you’d play against aggro and burn decks to gain life and disrupt their tempo, Gnarlwood Dryad helps to slow down aggro as well and is good against some midrange decks, Ishkanah is some extra back up against flyers and an alternate win con if the board is stalled, and Nissa, Vital Force seems to be a good card that works along with the theme of the deck. She allows you to put pressure on a slower, control type opponent with her +1, and her minus ability lets you get cards back from your graveyard that you might have had to mill away inadvertently. Appetite seems like a good card against Aetherwork Marvel decks or vehicle decks, while Chandra can do well against control decks as well as helping out against aggro. The deck is solid but still need more testing I think. I plan on continuing to play my RW deck because I’m comfortable playing it and I think it has a good chance against the metagame, but I’m worried that many decks will be looking for ways to shoot down RW variants. Hopefully my unique build will keep me safe and under the radar. I expect the current metagame to shift again after this weekend so don’t be shocked when it does. My friends have been saying it’s a good idea to stick with one deck and adjust it to the meta in these first few weeks instead of switching to a new deck every week and I think that’s some good advice. 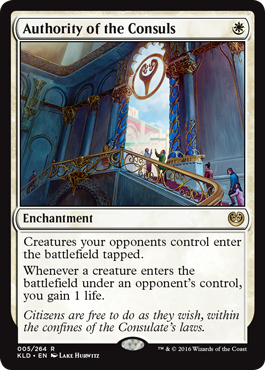 Hopefully you’ll find a deck that works for you and you’ll be able to hit the ground running in Kaladesh standard. Whatever happens, I wish you the best of luck and hope that IF you try out my builds that you can get some of the same success I have or better! Thanks for reading and be sure to check back next week for my articles on investing in standard cards for the new season.